524 luxuriously appointed 1, 2, and 3 bedroom suites with fully stocked kitchens and living rooms foster togetherness for family and friends. Enjoy the warm gentle breezes from the large oversized terraces overlooking the white sandy beaches and turquoise blue waters. The hotel's Gourmet Inclusive concept will ensure the most complete vacation experience from check-in to check out. 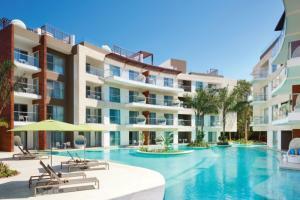 The Fives Azul Hotel, by Karisma is just a short stroll from downtown Playa del Carmen.